Sometimes, every day with a toddler can feel like an endless search for...something. One day, you have no idea how your keys made it into the potted plant; another day, you're looking all over the house for your glasses (which are obviously on your head). Or sometimes, your little one keeps you busy frantically searching for them—in the yard, on the playground, in the laundry hamper or the linen closet...searching, seeking, hiding, finding—that's pretty much the toddler existence! Here's an idea: dress your adventurous tyke in this Where's Waldo Toddler Onesie and they'll become easier to spot. Not only will you be able to keep tabs on them more readily, but the whole world will be looking out for them. 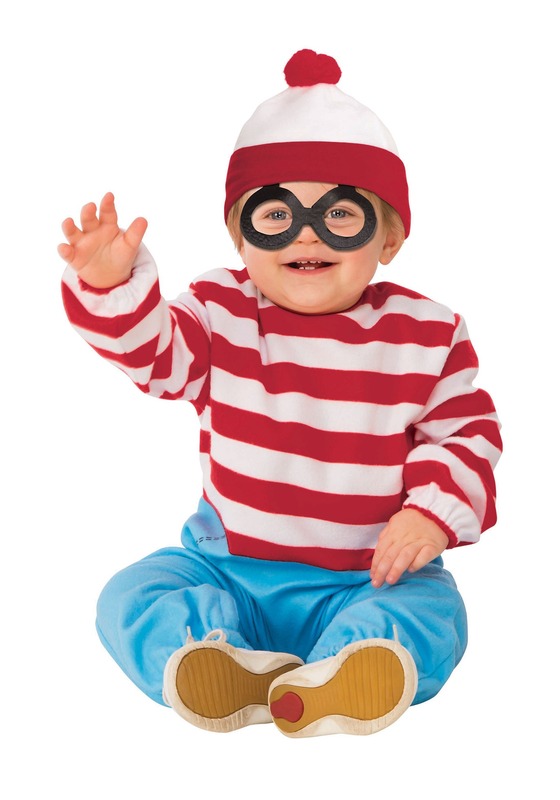 Everyone loves to hunt for Waldo in a crowd—why not harness that collective power to help keep tabs on your little one? Not only that but...uh...do you see how adorable this costume is? It seems like a no-brainer—which is great because it frees up headspace to keep track of all your things! This insanely cute romper is styled to look like Waldo's signature shirt and pants combo. The top is boldly striped in red and white, and the bottom looks like denim pants. You'll want to add the signature beanie and some form of black glasses. You can give your kiddo a backpack to tote around with a walking stick, kettle, cup, sleeping bag, binoculars, camera, snorkel, belt, and shovel, but we doubt they'll get far without leaving pieces of it behind! The good news about your on-the-move little tot? Their curiosity will take them on big adventures one day! Encourage that wanderlust by giving them this costume and teaching them to (safely) explore their surroundings. It'll be easier to spot them in the park or even in their pillow fort, and they'll look cute as heck scooting around their busy world!